Like this blog? Why not follow by email? No spam - just weekly blog posts! Word of the Week: chī fàn le ma? “Have you eaten yet?” is something you’ll hear a lot in China. When I first arrived I would often go out to the local food street at lunch time and bump into friends or colleagues along the way. 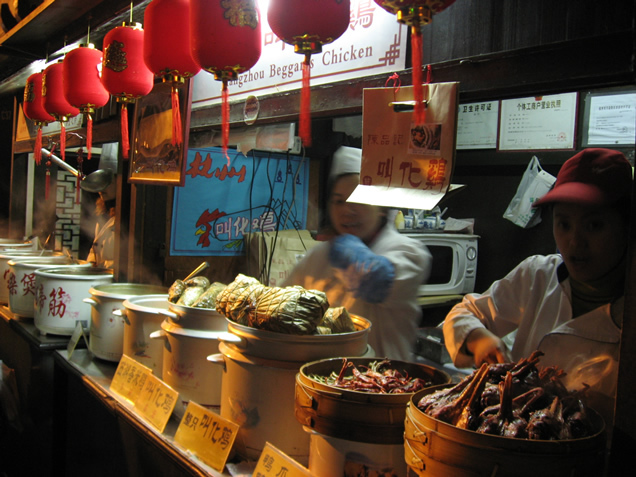 food streets are common throughout China. Some are cleaner than others. chī fàn 吃饭 literally means eat rice. chī is eat, fàn is (cooked) rice. However, in reality it means eat a meal, even if it’s actually noodles, Chinese dumplings or a Big Mac with extra fries and a large coke. le 了doesn’t really mean anything on its own. It is a particle indicating an action has been completed and so generally speaking turns a verb into past tense, but is usually dropped if the tense is clear from context. As you might have guessed, or already know “chī fàn le ma?” 吃饭了吗 is actually just a common way of greeting someone in Chinese. If someone asks you this they’re not inviting you to dinner. They also don’t expect you to go into any detail about your recent dietary habits. Imagine if you bumped into someone in the street, greeted them with “how’s it going?”, and received a lengthy description of their work life, love life, social life and medical problems. So when you’re greeted with “chī fàn le ma?” (have you eaten), the correct response is “chī fàn le” (I’ve eaten). Even if you haven’t actually eaten, just reply with “chī fàn le”. Trust me, it’s easier that way. This entry was posted in Word of the week and tagged word of the week. Bookmark the permalink.